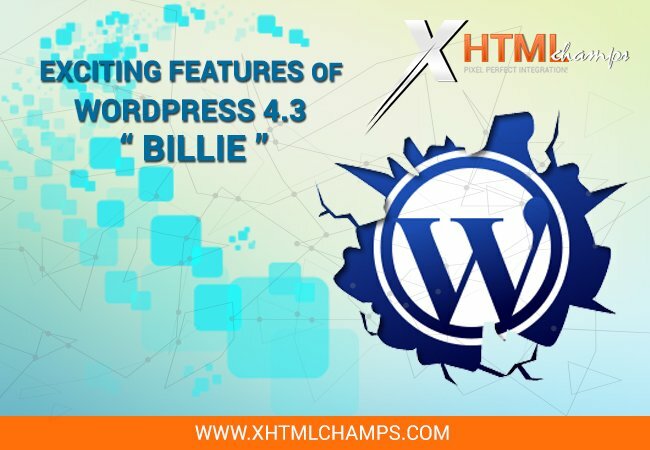 WordPress had recently launched its new version 4.3 and named it as ‘Billie’. A number of enhancements to the existing feature list with a host of brand new features have been implemented in this latest release. Customizer menu: This release provides easy options to create, add, edit and assign menus all while previewing it in the customizer, which provides a mobile-friendly and accessible interface. Easy site icons (Favicon): Site icons are the images that represent a website across multiple platforms. Earlier uploading a site icon was a Hercules task. First, it had to be uploaded as a favicon via FTP to the root directory, and then the Theme’s header.php code had to be edited. But now WP 4.3 allows easy upload the site icon (favicon) to iOS, Android, and Microsoft devices when a visitor bookmarks the site. Now, these Favicons are theme independent. Stronger passwords: Users are given options to accept auto- suggested password or to create their own password. The password strength meter is provided to analyze the password strength. An option to hide the password also exists in this release. The ‘New Password’ interface will be visible on the password reset and WordPress installations screens and the new password link will expire after 24 hours. Reset passwords will not be sent through emails. An email notification will be sent only when an email or password is changed. Word count: Word and character count has changed, instead of counting the words after tapping the return or enter key, the editor will automatically refresh and update the word count once you stop typing. Quick link preview tool bar: When you click a link in WP 4.3 visual editor, a small inline link toolbar is displayed with full URL along with buttons to edit or delete it. Comments turned off: WordPress 4.3 has brought in a welcome change of turning off on pages by default; this change is applicable to all custom post types too. This change will increase the security of the website as well. Currently, WordPress is reigning as a most widely used and the best CMS on the web and with this latest release of 4.3, it has brought in new incredible features which make it easy to write & post the content, setting up a site & customizing the site as well.